This was the initial location I chose to shoot Bonzai Rock. I wanted to get the sun setting in the background but I found that this composition was way too busy, thanks to the rocks in the background/on the right. I gave up on this but shot one and posted it anyways. This is one of the more "standard" (more common) Bonsai Rock photos -- with the trees and mountains in the background. Unfortunately, the sun was setting more northerly and there wasn't really any color in the sky in this direction. Again, I abandoned this composition but posted it in case people stumble upon this and want some help. After abandoning this composition and walking around trying to find a better spot I thought I might try it again now that the sun had gone down some more. Again, I still found it to be too busy. 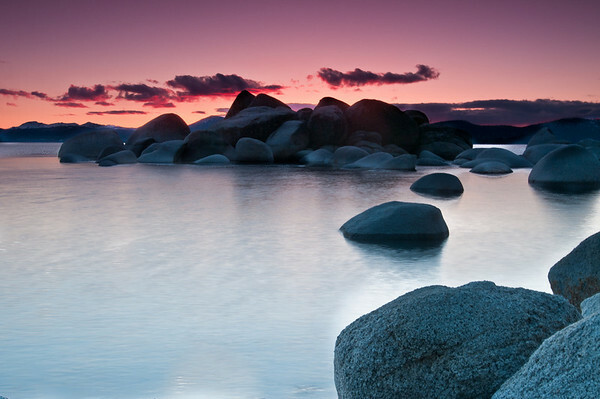 I also ran into a problem where my filters were filtering Bonsai Rock (because the rock was above the horizon line). I turned the filters to about 45° which brought some pink/orange colors out in the sky on the right but left a weir brighter sky on the left. Again, another icky photo but for teaching purposes for others I posted this anyways. 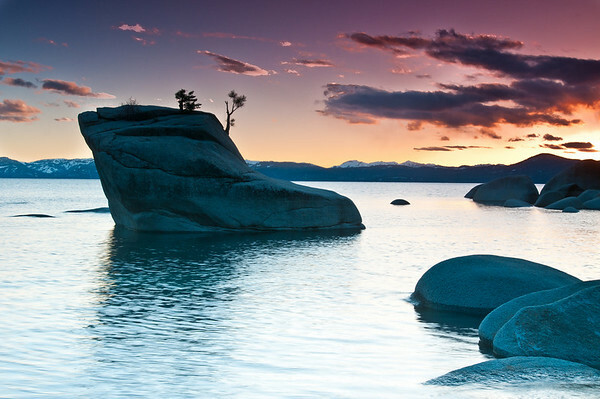 Bonsai Rock is located on the north-east side of the lake and by the end of April the sun was setting more northerly than due west. The sunset on this was actually quite gorgeous -- it made the mountains behind these rocks appear to be on FIRE -- pretty neat. 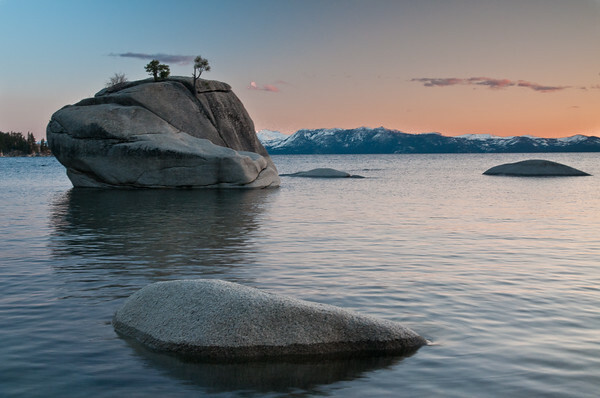 I spent most of my time trying to find a good composition of Bonsai Rock, but I couldn't help myself and got one quick shot of the sunset over the neat rocks here. [Update on 8/29/11] I decided to re-edit this image since it's one of my favorites. I pulled up the brightness in the rock and un-cropped the photo to get more of the reflections. Thoughts? 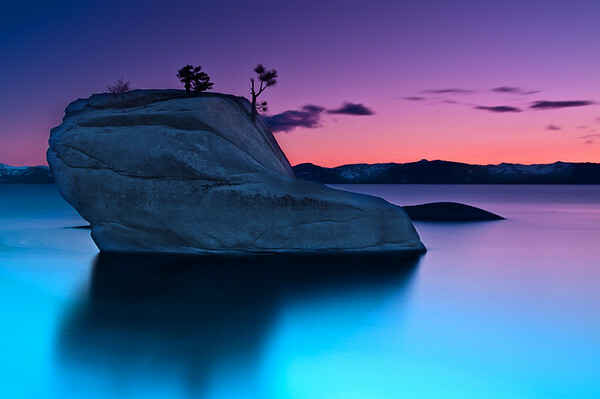 A bunch of months ago I saw a local photographer and one of my good Flickr friends, David Shield (http://www.flickr.com/photos/davidshield/), post a photo from "Bonsai Rock" in Lake Tahoe. 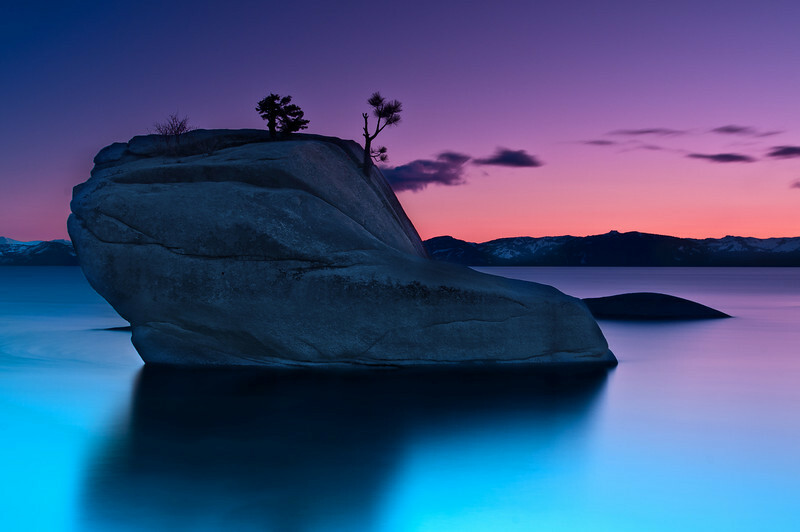 Bonsai Rock is located on the north-east side of the lake, about 45 minutes from South Lake Tahoe. If you stand on the east shore you can get spectacular sunset photos with the rock in the foreground and the sunset in the background. Ever since I saw his photo this place was on my list of things I wanted to photograph! I attempted this photo a couple weekends ago but a storm rolled in and there was no color in the sky. I didn't even bother leaving our ski cabin to go shoot. Finally this last weekend the weather looked great and I had a chance to drive up to the north-east shore and find Bonsai Rock. I've read a lot of blogs and viewed a lot of photos of Bonsai Rock but it was 1) harder to find and 2) harder to photograph than I expected. I spent over an hour trying to find the right location to setup the tripod and take the photo. We had a gorgeous sunset (at one point the sunset over the mountains made it look like the mountains were on FIRE!) with some great color but I couldn't keep the photo simple enough to my liking -- there were just too many rocks in the photo. 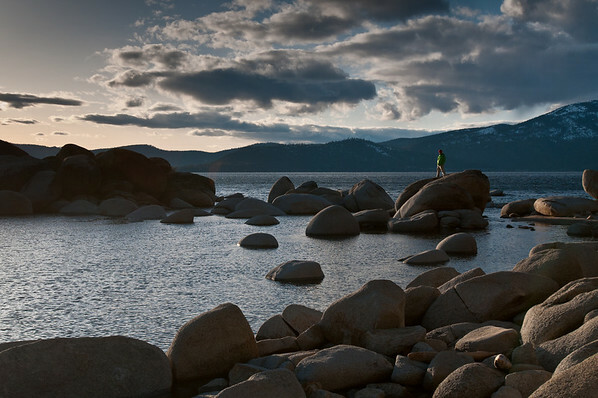 I didn't realize that the water level of Lake Tahoe rises and falls. This was a medium height: some of the rocks that many other photographs show (and lead the eye into Bonsai Rock) were covered up, but a lot of the rocks behind Bonsai Rock were completely uncovered and distracted from the background. Just as I was about to leave and call it a disappointing failure I thought about taking this one last, simple, composition zooming in on the rock. The sun had set about 15 minutes earlier but the color in the sky all of a sudden lit up further west than it had earlier and a long exposure (2.5 minutes) got the silky smooth water and brought out the color in the sky! I'm quite happy with how this came out! To find Bonsai Rock park at 39.183690 , -119.927088 and then climb down the side of the hill to 39.184844, -119.927727. More detailed directions if you're trying to find it: The parking location is about 6.7 miles north of the highway 28/highway 50 junction. There's a small turn-out on the side of the road (on the left side of the road if you're heading from S. Lake Tahoe. If you get to what looks like a highway rest stop on the right you've gone too far. If you're coming from North Lake, it's on the right, just past Sand Harbor after the rest-stop thing on your left). If you want to throw in your GPS coordinates the parking spot is pretty much exactly at 39.183690 , -119.927088. Once you park you have to hike down a steep hill slightly north of where you park. A lot of people mentioned that it was a "steep hike" but I never realized that it was about a 200 foot climb down to the water. It wasn't extremely difficult to get down, but we did have to hold onto some trees/roots/rocks to make sure we didn't slip and tumble into an injury. Getting back up after the shoot was a decent workout (note: if you're going at sunset, I recommend that you DON'T forget to bring a flashlight). Bonsai Rock itself is located at 39.184844, -119.927727. 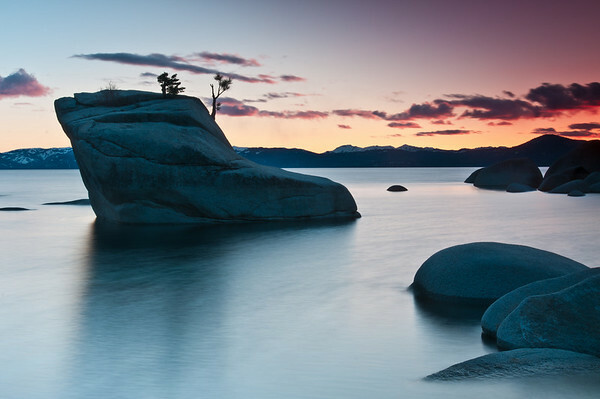 Mike Wiacek (http://www.mikewiacek.com/blog/2009/08/bonsai-rock-formation-lake-tahoe/) has been so kind as to create a custom Google Maps for Bonsai Rock. Check it out at http://maps.google.com/maps/ms?ie=UTF&msa=0&msid=117078272024675730991.000471c9db1839af7e9e6. Nikon D300s w/Nikkor 17-35mm f/2.8 ED-IF AF-S: 35mm, f/11, 2.5 minutes, ISO 100, Tripod Lee Foundation Kit Filter Holder B+W F-Pro Circular Polarizer, HiTech 0.9 Graduated ND, Hitech 0.9 ND Soft, and 0.6 ND Soft. No HDR!